A quick nerd-note: this newfangled site is powered by Jekyll, a technology that us geeky sorts call a “static site generator.” It’s like a geekier version of WordPress. It’s a fabulous tool for mocking up simple sites (it’s what the Always Forward demo site is built from, too). You need to be familiar with version control and editing text files to use it, but it’s a great way to get your feet wet with that. If it sounds interesting, I’m happy to answer questions about it! It’s better to have too many projects than too few! But this may be getting a tad ridiculous. One of my big challenges for 2018 is going to be focus. Placeworks Civic - For the past few years, building this civic engagement platform for the urban design firm PlaceWorks has been my top client. The platform has evolved into a set of highly customizable tools for encouraging scalable and democratic design thinking about land use. Last fall, it took a big step towards closer to the “SimCity for Real Projects With Real Data” vision, with a project in Livermore that got some fabulous coverage on the local TV news. (I’m pretty sure this is the first time I’ve seen camera angles pointed at a screen running my software. At least since the 90s!) This is one of the most fascinating projects I’ve ever had a chance to work on, and it’s aimed right at a vexing, complicated and strutural problem, the housing crisis. I’m really excited about the plans we have for this year for it, starting with a big new client, and next building a marketing site so that I have somewhere to link to and you can read more! 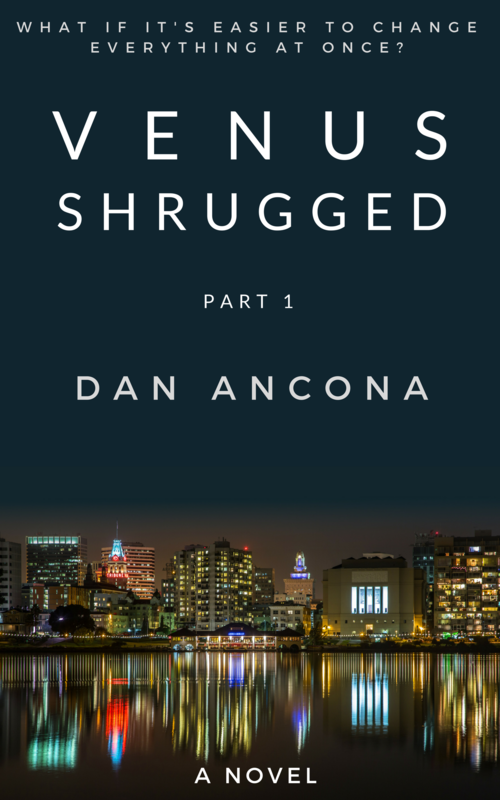 Venus Shrugged - Part one came out last April, and I have the deep, time-consuming structural edits for part 2 on my desk. I’ve learned a lot about book marketing in the past year, but it basically all boils down to: keeping writing and participate in conversations. There’s too many variables to say when part 2 will be out, but I swear, it’s happening. Always Forward - This is a new grassroots PAC and provider of accountability and tracking tools for elected represenatives. This is either going to take off in the first quarter or so, or I’m sticking it on the back burner. It’s moving on three tracks: the first one is the accountability, targeting & tracking tools, the second one is the messaging/PAC side of it, and the new but long-term third track is around building distributed AI tools for activists. The first step is applying to New Media Ventures new open call on shifting the story. Democratic Future Club - This one hasn’t gotten past the pile of notes stage, but I really miss being involved locally. When Jenifer and I were involved years ago locally in Santa Barbara, it was some of the most deeply satisfying work I’ve ever done. And there’s a big gap for a local club that would be diverse and accessible to people who can’t regularly make it to meetings, either because of their work, or because of kids or disabilities. Not sure I’ll get to this one! Home and Fun - Jenifer is still rocking her role at WDN, so I’m still primary parenting. (If you don’t believe how much she rocking it, listen to rising mega-superstar consultant Jessica Byrd talking about their work on Kamau Bell’s podcast - the good stuff starts around 6 minutes in) This includes cooking dinner for the mini-cohousing every night-ish, pitching in at school periodically and my second season coaching little league. And as foolish as it sounds, I might have a fun side project popping up, but I can’t say much about it yet. One of the best parts about (maybe!) becoming a writer is that it’s been a great excuse for reading tons of books. Almost makes the gnashing of teeth around book marketing worth it! Sorry I didn’t bother with links for all these; I got too much stuff to do! But these can all be found ideally at your friendly local bookseller, or easily delivered to one via IndieBound! (And they can also probably be found via giant conglomerate with disturbing labor practices, but, you’re on your own for that.) I’m not really getting into recommendations or not here. (beyond what’s in the parentheses - again, too much to do!) Honestly, all these were pretty great, and you should be showering their authors with money.